MORE FLORADORA LISTED. ONE OF SIX AVAILABLE. Lowestoft Deer - A8063. Booths blue & White Dinner Plate. Booths China "Netherlands" Hexagon Plate 9 "
As described, lots listed in this pattern. Booths Real Old Willow Vintage Blue, White and Gold Side/Sandwich Plate. A8025. Stamped; Booths, Made in England, 'Real Old Willow' A8025. Excellent Condition. In excellent condition with no chips, cracks or crazing. Colours are strong. The gold edging has some light rubbing. Some light cutlery marks in the central area. 4.5 inch diameter 2.5 inch high I have more of this pattern on my othoer listings. In excellent condition with no chips, cracks or crazing. Colours are strong. The gold edging has some rubbing. Some light cutlery marks in the central area. I have more of this pattern on my other listings. Booths Floradora 6 Dinner Plates 26cm. Dispatched with Royal Mail 2nd Class. Gorgeous individual cake/sandwich serving plate decorated with the Green Parrot pattern. Removable handle for ease of washing. All in good order and fully back-stamped dating this piece to around the first quarter of the 20th Century approx 1917- 1922. Booths real old willow side plate a8025. 7 1/2in long Excellent Condition no chips or cracks Dispatched with Royal Mail 2nd Class. Booths Floradora 6 Luncheon Plates Side 15 Cm. Dispatched with Royal Mail 2nd Class. Booths England side plate. REAL OLD WILLOW. Side plate made by Booths. Circa 1960'S. 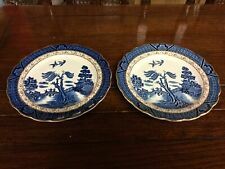 Booths Blue & White Real Old Willow Side Plate 1944+ A8025. The letter & numbers A8042 appear on the back. For sale are 3 small tea/side/bread&butter plates from the Booths Floradora design. Booths Floradora Side Plate 7"
Booth's FLORADORA. A Side Plate. Poole Pottery Twintone Mushroom / Sepia Dinner Plates x 4 (#201614890509) £15.99 View Item. lydae09 ( 144. Spode Flemish Green Scroll Pattern Dinner Plates x 5 (#201594928433) £23.99 View Item. FABULOUS PLATES, CAN'T WAIT TO USE THEM, SO PRETTY! ). I AM UNSURE OF THE PATTERN ALTHOUGH IT IS VERY SIMILAR TO POMPADOUR PATTER. Booths Floradora 4 Cereal/Dessert Bowls 16 Cm. Dispatched with Royal Mail 2nd Class. MORE FLORA DORA LISTED. IN USED CONDITION,WITH RELATIVE AGE/USE WEAR. ONE OF SIX AVAILABLE. Real Old Willow. Side Plate. Rest of World for £75. UK for £12. BULK ORDERS. Booths Chinese Rose Tea Side Plate 17.5cm. No chips cracks or damage some light usage marks. Please look closely at the pictures before you buy. Pattern:Real Old Willow - Gold Edge - Brown Trellis. Item:Tea / Side / Bread & Butter Plate. Size:6 3/4". Pattern:Dragon - Turquoise - Gold Edge. Item:Tea / Side Plate. May include seconds. Size:6 3/4". Item:Tea / Side / Bread & Butter Plate. Size:6 3/4". Pattern:Dragon - Turquoise - Gold Edge. Item:Tea / Side Plate. Size:6 3/4". Pattern:Dragon - Turquoise - Gold Edge. Item:Tea / Side Plate. May include seconds. 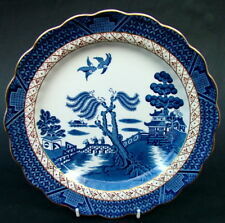 Booths 'British Scenery' A8024: Red Country Scene: Side/Salad Plate: 8½" Dia. Crackle-glaze, and a small unglazed area from firing. The backstamp was used from 1912 to the 1930's. 'British Scenery'. "British Scenery". Red Countryside Scene. Side/Salad Plate. Made In England. UK Wherever Possible.